I haven’t been doing too well with my diet lately. I had hit a plateau that I couldn’t get out of, then last week I weighed in at 194, 2lbs more than I was the previous week. This week after my last weigh in I had actually gone up to 199 and that was my aha moment. I was gaining too much weight and realized that I wasn’t doing very well and in order to get back on track, I was going to have to go back to my healthy diet. We went to Food Maxx and I bought 14 Weight Watchers Smart Ones frozen dinners and I also bought some Malt-O Meal Original for my breakfast. I had been eating Cheerio’s since January with a banana, but I needed a change. I actually wasn’t sure if Malt-O Meal was going to be good for me, but it shows up as green in the Noom app so I guess it is. 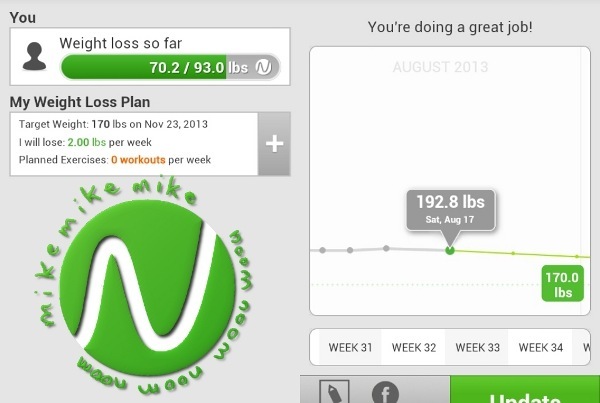 Today was weigh in day and I am happy to say that I am back down to 192.8 which is what I was 2 weeks ago. I think that I just needed to go off track for a couple of weeks so that I could gain a new perspective and a new momentum and refocus all of my energy again into losing more weight to hopefully get me back on track so I can get down to my ultimate goal weight of 170lbs. The doctor told me that I didn’t need to lose any more weight, but I still have a fat stomach and I don’t want to have that anymore. I really want to lose as much fat as I possibly can. I know I can lose the rest of this weight in only a couple of months if I keep going the same way I did to get to this point. I just need to have the same determination to get the job done and I will accomplish my goals with complete success. I haven’t been riding my bicycle because of my back pain, also because of how hot it is. I am also having issues with not just my back tire going flat, but now my front tire too. I honestly don’t know what is wrong with my tires, why they keep going flat. It’s mind boggling to me. Neither tire have a hole in the tube and there isn’t a thorn or sticker in the tire. I don’t understand how they can both go from being fully inflated at 60PSI one day, to being around 20PSI the next. It’s supposed to hold it’s pressure for a long time, especially since my bike hasn’t moved an inch in a month. When it cools down I will start riding it again. I would much rather ride my bike before the sun comes out to not only avoid the heat, but also avoid the sun because I burn easily. Because I broke my arm at night, my partner doesn’t want me to ride when the sun isn’t out because he thinks I will break my arm again. It was an isolated incident and it had nothing to do with the sun and everything to do with me not paying attention. I’m sure it would have happened no matter what time of day it was. At any rate, I am hoping to be at my goal by at least Halloween if not sooner. That would be awesome. Not that I have a reason to be at my goal by Halloween, I just want to be that’s all lol.